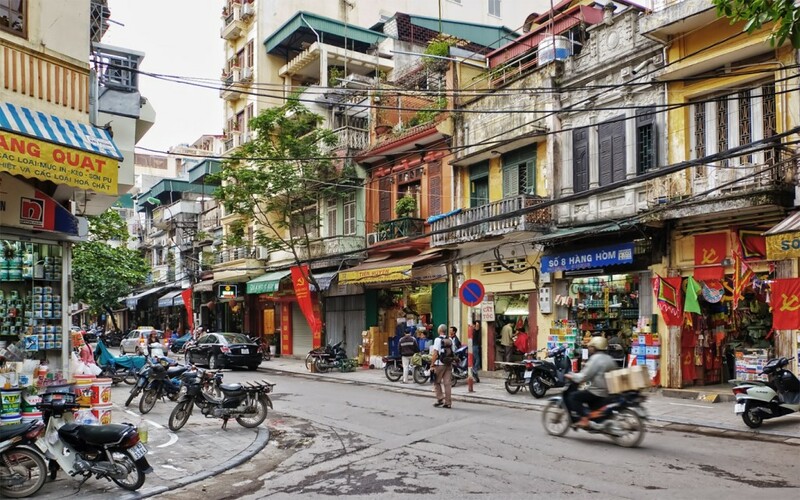 Hanoi Old Quarter is a must-go place by any means if you visit Hanoi with a curiosity to travel back in time or a genuine desire to have a grasp of the capital’s culture. With its ancient-styled narrow streets full of antique brick houses, Hanoi Old Quarter in the heart of Hanoi, a quickly developing city where changes take place every day, every hour and every second, seems to nostalgically resist the time flow while still actively trying to adapt to the hustle and bustle of this modern city. Once a busy area where artisans and merchants gathered to sell their products, Hanoi Old Quarter is described with many narrow and meandering streets, each of which bears the good’s name that was specifically made and traded there including Hang Go (Wood Product), Hang Ma (Paper Product), Hang Bac (Silver Product), just to name a few. West Lake is a huge body of water with a circumference of 17km and so many nightlife venues, five-star hotels, stylish restaurants, cafes and historic places of interest that are worth your time along its shoreline. 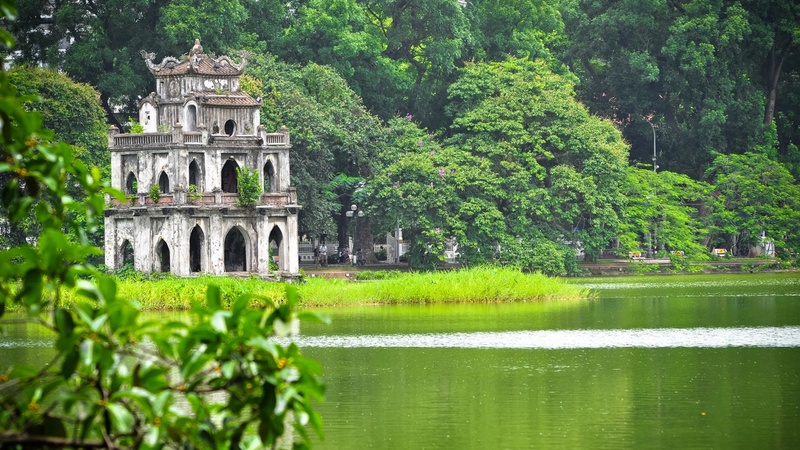 As this site, which is accessible within a 15-minute drive from Hanoi Old Quarter provides a sanctuary of great natural beauty with plenty of quiet spots in the sizeable botanical gardens , many Hanoians and foreigners seeking respite from the busy city make their way to this high-end district. Although one legend claims that this lake was formed when the Dragon King Lac Long Quan drowned a wicked fox spirit with nine tails in his lair, the actual history of West Lake, which is locally known as Tay Ho Lake, remains a mystery to this very day. With boats for hire and lunch on a floating restaurant makes a novel dining option, West Lake is a gorgeous place to while away an afternoon. Tran Quoc Pagoda, Quan Thanh Temple are two of the most notable points of interest at West Lake. Referring to dining options, with the northern side is where you can find the affluent residential neighborhood and five-star hotels while a whole street dedicated to local seafood restaurants in Tay Ho District, the southern part of West Lake is the place to go for seafood bites. 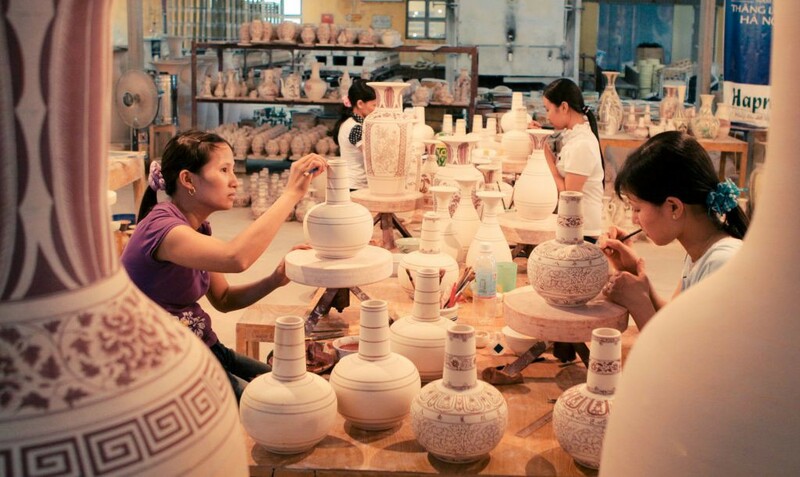 With its history of seven centuries, Bat Trang traditional porcelain and pottery village is an awesome attraction in Hanoi that no one should ignore. Thanks to its location in an area rich in clay, the village has many advantages of ingredients to make many fine ceramics. In addition, because of its position lying besides the Red river, between Pho Hien and Thang Long, two ancient trade centers in the north of Vietnam during the 15th-17th century, Bat Trang’s ceramics were popular products in not only domestic market, but also international ones thanks to Chinese, Japan and Western trading boats passing by. Going to Bat Trang, you can join a buffalo tour or take a walk for shopping and sightseeing. Porcelain and Pottery Market in the village, where you can directly make pottery products by yourself, is also a place to go. There are so many youngsters and international travelers so interested in this pottery-making experience that they take a whole day in this market to create a gift for friends and family.